It's the summer of 1959. For the families who live on Connors Lane in Washington DC, life is still defined by what one did during WWII. Behind each door lives a possible spy or Nazi sympathizer, the family of a foreign diplomat, or someone who escaped the conflagration in Europe just in time. But it is also the summer of an inexplicable spider infestation--surely evidence of "insect warfare" by the Russians, thinks our young narrator John, and his best friends, Ivan and Max. When a rare, scorpion-like vinegaroon is discovered and sequestered for museum study, the boys, along with their tomboy accomplice, Beatriz, hatch a risky midnight plan to steal the poisonous creature for their own devious purposes. At the same time, under the tutelage of Ivan's glamorous aunt Elena, they plan to forge a spirit of bonhomie in the neighborhood by throwing a party in John's grandparents' backyard. Fueled by punch the boys doctor with a jug of Brazilian rum, the adults let down their defenses until Elena, already a lightning rod for her Ukrainian birth, swinging social life, and outspokenness on behalf of refugees, roars off with a stranger on his motorcycle. What happens next will change John's life forever. LISA HOWORTH was born in Washington, D.C., where her family has lived for four generations. She is a former librarian and the author of the novel Flying Shoes. She has written on art, travel, dogs, and music for the Oxford American and Garden & Gun, among other publications. Howorth lives in Oxford, Mississippi, where she and her husband, Richard, founded Square Books in 1979. “Summerlings is a manic, finely wrought, compelling dash, that transports the reader back in time to an America (sweet-hearted, wide-eyed) that feels like a lovely, lost foreign country, lost to us in this dark national moment. Howorth is a joyful writer who charms the reader with her command of detail and her precise nostalgia." "Lisa Howorth’s Summerlings practically hums with feeling and memory. One can nearly hear the clang of the Good Humor truck, the buzz of the gnats on sweaty summer necks. Funny, poignant and ultimately deeply affecting, it will transport you, move you, take your breath away." 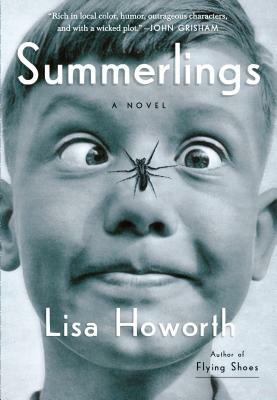 "Lisa Howorth’s Summerlings might masquerade as a coming-of-age story—a small pack of boys in 1959, their unhappy DC home lives, the Ukrainian woman they all adore—but in reality it’s so much more. To read this book is to be transported to another era, one both otherworldly yet instantly accessible thanks to Howoth’s incandescent and evocative prose. The experience is akin to falling into someone else’s memories and never wanting to leave."